A dental sealant is a plastic coating which is usually placed on your back teeth, the molars or premolars, and on top of the tooth that does the chewing, known as the occlusal surface. Dental Sealants help protect your teeth from decay. Why would a dental sealant be placed on my teeth? This chewing surface has grooves on them (go ahead, take a look in the mirror at your molars). These grooves are called fissures. These fissures can be vulnerable to decay. Your fissures can be deep, making them more difficult to clean. Some fissures are even narrower than a single bristle of a toothbrush. Plaque can hide and accumulate in these areas. Plaque contains bacteria that produce acid that attacks your enamel and as a result, cavities can develop. While fluoride helps prevent decay and helps protect all the surfaces of the teeth, dental sealants provide extra protection for the grooved and pitted areas by providing a smooth surface covering over the fissured area. Are dental sealants only placed on the chewing surface? Dental sealants can sometimes be placed teeth if they have grooves or pits to help protect the surfaces of those teeth. How does my dentist apply a dental sealant? The tooth surface is thoroughly cleaned. Next, the tooth is washed with water and dried. Then a solution that is applied to the fissured area of the occlusal area. This creates a rougher surface than the surrounding tooth enamel. This rough surface enables the dental sealant that comes next attach to the tooth. The dental sealant is placed on the tooth and hardened. Most often, a special light is used to harden the dental sealant. Once the dental sealant has hardened your tooth is now stronger and resistant to tooth decay in that particular area, and you can chew on the tooth again. Dental sealants can last many years to come with proper oral care. Yep! 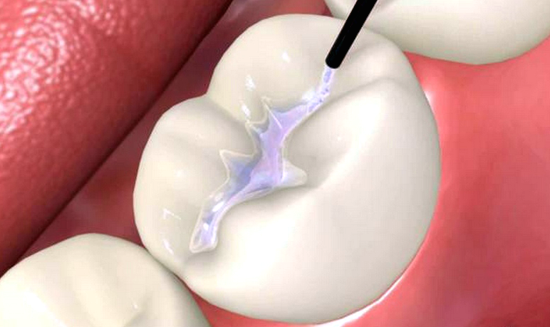 Dental sealants only protect the surface area that they are placed on, so it does not cover the whole tooth. Fluoride helps protect the complete tooth from decay that results in cavities. For more information Contact Us Now!